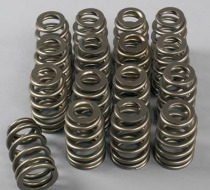 COMP Cams® Beehive™ Valve Springs revolutionize performance street applications. By reducing weight, without sacrificing valve control, street cars are now able to turn more RPM and have higher lift camshafts while maintaining the stability of OE applications. The Beehive™ design reduces spring and retainer weight, while yielding greater spring stability. The oval shape of the wire allows better heat dissipation for longer spring life. Outside Diameter of Outer Spring (in) -- 1.075 in. Seat Load -- 125lb. @ 1.800in. Open Load -- 367lb. @ 1.150in. Coil Bind Height (in) -- 1.100 in. Spring Rate (lbs/in) -- 372 lbs./in. Inside Diameter of Outer Spring (in) -- 0.650 in. Quantity -- Sold as a set of 16. Notes: O.D. 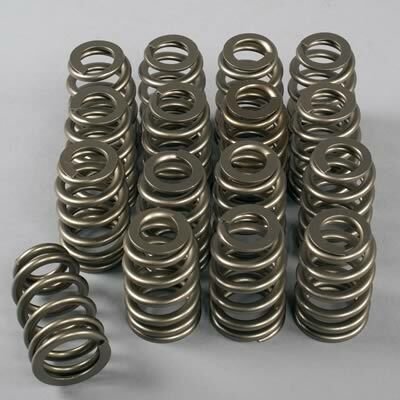 at the top of the spring is 1.075 in. and 1.310 in. at the bottom. I.D. at the top of the spring is 0.650 in. and 0.885 in. at the bottom.